Probashbangla24 online Desk :US President Donald Trump took his enthusiasm for his detente with North Korean leader Kim Jong Un to new heights on Saturday, declaring at a rally with supporters that “we fell in love” after exchanging letters. 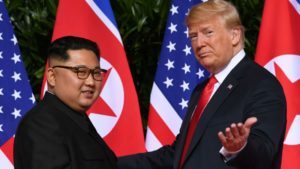 Trump and Kim have said they want to work toward denuclearizing the Korean peninsula, holding an unprecedented meeting earlier this year in Singapore to discuss the idea. Before they turned the page on decades of public acrimony, the leaders regularly traded threats and insults as North Korea pushed to develop a nuclear missile capable of hitting the United States. “I was really being tough – and so was he. And we would go back and forth,” Trump told a rally in West Virginia. “And then we fell in love, okay? No, really – he wrote me beautiful letters, and they’re great letters,” he said. His supporters laughed and applauded. Trump grumbled that commentators would cast him as “unpresidential” for describing Kim in such glowing terms. The Trump administration is preparing for a second summit with Kim to talk about denuclearization. The time and location have not yet been announced. Despite the warmer tone to the relationship, North Korea has not complied with US demands to provide a complete inventory of its weapons programs and take irreversible steps to give up its arsenal. Three senior US officials involved in North Korea policy said this week that no progress has been made in moving toward serious negotiations on eliminating or even halting Kim’s nuclear weapons and ballistic missile programs. So far, all three said, speaking on the condition of anonymity, the North has not even agreed to define basic terms such as “denuclearization”, “verifiable”, and “irreversible”. Most of the steps it has said it has taken could easily be replaced or reversed.